TOKYO -- Lexus will unveil a near-production version of its long-awaited sports coupe at the Tokyo Motor Show, a four-seater dubbed the RC that fills a big void in the luxury brand's lineup. The car's styling draws from the LF-CC coupe concept shown at the 2012 Paris auto show, with a gaping spindle grille and wide-set side air intakes. It gets a rounded roof silhouette and sharply creased rear fenders. Its L-shaped rear combination lamps and headlamps were inspired by the LFA top-tier sports car and the LF-LC concept shown at the 2012 Detroit auto show. Production of the LFA ended last year. The car will come with either a traditional 3.5-liter gasoline powertrain or a hybrid system teamed with a 2.5-liter engine. Lexus is calling the RC a production prototype. Executives declined to say when the car will arrive in showrooms, but it is expected to go on sale in the second half of next year. The RC is expected to sit near the top of of a revised Lexus lineup. If the SC coupe and LFA were still being produced, it would slot between them. Production of the SC ended in 2010, and the last of the limited-edition $375,000 LFAs rolled out of Toyota Motor Corp.'s LFA Works last December. Lexus executives want another halo offering to polish the brand's sports image. Lexus is calling the RC a production prototype. 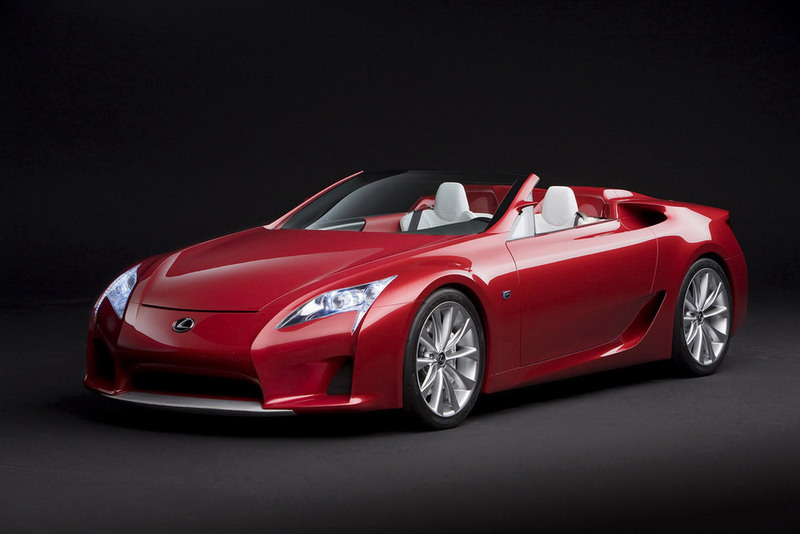 Lexus spokesman Satoshi Miyata called the RC the new "symbol" car. Also on display in Tokyo will be a variant of the LF-NX crossover concept shown at this year's Frankfurt auto show. The upcoming version will be equipped with a new 2.0-liter turbocharged gasoline engine instead of the hybrid drivetrain shown in Germany. Back then, Toyota turned to turbos to boost output from already powerful engines. Now it wants to use the technology to eke out more power from smaller, more fuel efficient ones. The exterior shares the same jagged look of the LF-NX shown in Frankfurt and gets an interior with touch pad controls.